And just who is to blame for the violence in the Middle East? Tom and Jerry to blame for Middle East violence. Who knew? At 8 P.M. tomorrow evening sirens will sound throughout Israel. Traffic will come to a complete halt as Israelis stand in silence for one minute to honour and remember their fallen soldiers and victims of terrorism. This will be followed by ceremonies at military cemeteries and government institutions all evening and all of the next day until sundown. Who will stand with me to honour and remember the hundreds of Palestinian children and women killed by Israeli soldiers and zioterrorists? Who will stand with me to honour the memory of Democracy itself in Israel?? Hopefully I will not be standing alone. According to both Jewish and Muslim rituals, a dead person must be buried as soon as possible. 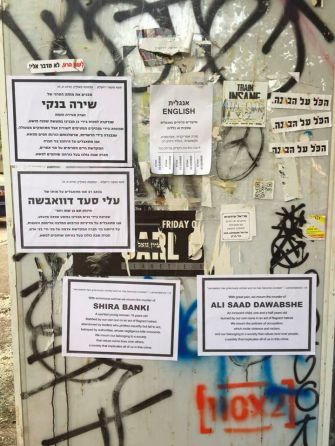 Notifications are usually posted in Jewish neighbourhoods in Israel to announce the time of the funeral. Announcements are made via loudspeakers from local mosques announcing the same. Whatever the reasons are for this show of solidarity, they are positive moves. Perhaps it is in preparation for the demise of the Jewish State itself, if these senseless murders continue. It’s simply not possible to cheer for the brigade commander who shoots a Palestinian teenager, and then be shocked by settlers who throw a firebomb at an inhabited house. Israelis stab gay people and burn children. There isn’t a shred of slander, the slightest degree of exaggeration, in this dry description. True, these are the actions of a few. True, too, that their numbers are increasing. It’s true that all of them – all the murderers, everyone who torches, who stabs, who uproots trees – are from the same political camp. But the opposing camp also shares the blame. All those who thought that it would possible to sustain islands of liberalism in the sea of Israeli fascism were shown up this weekend, once and for all. It’s simply not possible to cheer for the brigade commander who shoots a teenager, and then be shocked by the settlers who set a family on fire; to support gay rights, and hold a founding conference in Ariel; to be enlightened, and then pander to the right and seek to partner with it. Evil knows no bounds; it begins in one place and quickly spreads in every direction. Republican presidential contender Donald Trump said Thursday he “totally disavows” white supremacist leader David Duke after the latter delivered a rant arguing that Jews controlled America. “Antisemitism has no place [in] our society, which needs to be united, not divided,” Trump said in a statement sent to media outlets, according to The New York Times. Duke, a former grand wizard of the racist Ku Klux Klan group, used his radio program on Wednesday to lash out at Jewish Republicans who have opposed Trump’s candidacy. “I think these Jewish extremists have made a terribly crazy miscalculation, because all they’re going to be doing by doing a ‘Never Trump’ movement is exposing their alien, their anti-American, anti-American majority position,” Duke said, according to a report on the broadcast by the Anti-Defamation League. “They’re going to push people more into an awareness that the neocons are the problem, that these Jewish supremacists who control our country are the real problem, and the reason why America is not great,” Duke added. In a later statement, the ADL “welcomed” Trump’s disavowal. Duke has praised Trump repeatedly, and urged his followers to vote for him. Trump has denied he harbors anti-Semitic views, and has often pointed to his own close relationships with Jews, including his Orthodox-convert daughter Ivanka and Jewish son-in-law Jared Kushner. Trump has faced scathing criticism from some quarters, including the ADL, for appearing to avoid criticizing the white supremacist leader in the past. Critics noted that Trump draws a great deal of his support in the Republican primary race from working-class whites, and charged that Trump was avoiding disavowing Duke, among other racist supporters, in order not to alienate supporters. The Republican race all but ended this week after Trump’s resounding victory in Indiana and the subsequent withdrawal from the race of his two remaining opponents, Texas Senator Ted Cruz and Ohio Governor John Kasich.